As more and more Americans are taking advantage of streaming video on demand services like Hulu or TV Everywhere apps, television as we know it is being redefined. A big part of that revolution is which screens we use to access these services. While television sets aren’t going away, they’re no longer the only place to watch our favorite shows. 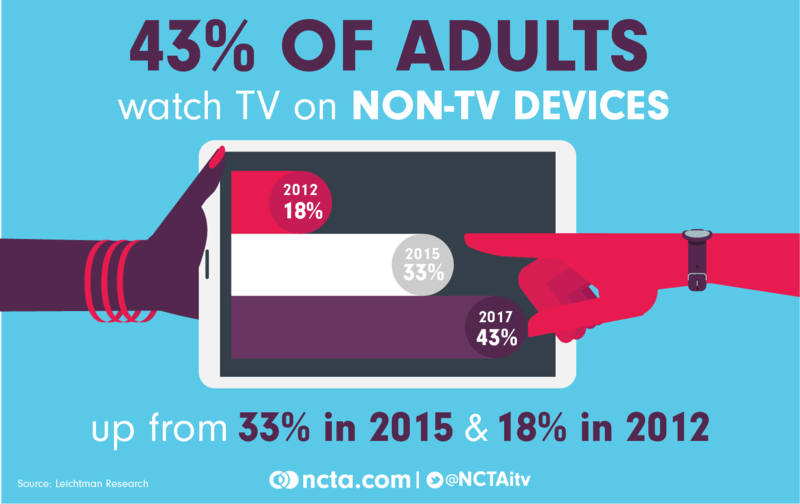 According to new data from Leichtman Research Group, 43 percent of adults watch tv on non-tv devices like tablets, laptops and phones. That’s up from 33 percent in 2015 and 18 percent back in 2012. As our lives grow more and more connected, we fit entertainment into our schedules instead of building our schedules around entertainment. Now more than ever, consumers are truly in control of their entertainment diets. For more information about the TV app revolution, check out our website.